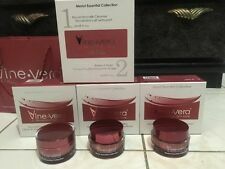 Vine Vera Resveratrol Shiraz Intensic Non-Surgical Syringe. 10ml Syringe. Reduces the appearance of deep wrinkles. Love it, makes under-eye circles & wrinkles disappear. Just apply VERY SPARINGLY and gently "pat" under the eye for excellent results. Received many compliments about how good I look since using this product. Expensive, but well worth it. I use this product every day. It amazed me the first time I used it several years ago and it continues to amaze me every day tightening up the skin below my eyes. This product tightens areas where wrinkles are present and makes them less noticeable. Wrinkles lessen each time you apply the product. Like this product and would recommend it's use. Nice under eyes but not very effective on other parts of face. Last about 5 hours. Hopefully will help tighten skin long term.